On my last day in Colorado, I went on a field trip to learn about the geology of the area. The main event was a trip to the Lyons Cemex quarry north of Boulder, where they mine the Niobrara formation to make cement. Interestingly, the same formation is being penetrated beneath the surface for oil and gas only a few thousand metres away. Apparently, the composition of the Niobrara is not desirable for construction or building materials, but it makes the ideal cement for drilling and completion operations. I find it almost poetic that the semi-exposed, western part of the formation is mined so that the deeper, eastern parts can be drilled; a geologic skin-graft, of sorts. The Lyons Cemex quarry operation provides about 80% of their cement production to the oil and gas industry. The field trip hosts, Manika Prasad and Mike Batzle (shown above), who are famous for their propensity for rock abuse, described the stratigraphy in Boulder County. The Niobrara shale is an organic-rich source rock in the Denver-Julesberg (DJ) basin. Although it is in the early stages of exploration and development, the Niobrara is being compared to the Eagleford shale and the Bakken shale, in a geologic and reservoir context. 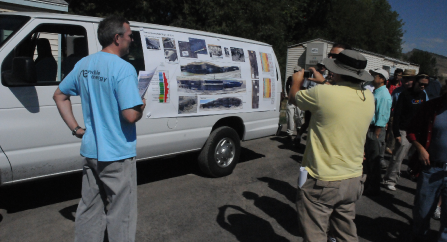 At the Cemex quarry, the over-sized van was a great place for a poster presentation on the units within the Niobrara formation. The formation is comprised of a series chalks and marls; the marls being sought after for their high-organic content. Integration of outcrop data and core with borehole gamma-ray, resistivity, and FMI measurements allows geoscientists to estimate the distribution of facies and density of natural fractures. It was one of the nicest field posters I have ever seen, due in part to those clever refrigerator magnets! At the base of the Niobrara is the Ft. Hayes limestone. It is filled with fossils and I also spotted a few stylolites (shown here). Up-section, the lower chalk and marl units are exposed within the quarry. 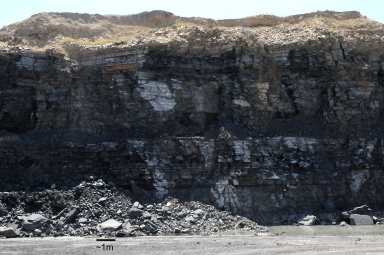 The quarry face (shown below) is approximately 35 m high and shows vertical heterogeneity, oblique fracturing and joints. 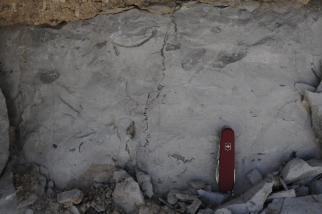 Episodes of volcanic ash throughout the deposition of the Niobrara has placed centimetre-thick, pyrite-rich bentonite layers (shown below) that serve as age markers and planes of weakness throughout the formation. Weathering and stress relaxation from uplift has altered these rocks from how they would otherwise appear in a buried reservoir context. But it was neat to see the hetereogeneity, and the architecture of these mudrocks. I was told that some operators produce oil in the range of 30–35°API, and sure enough, after smashing open several rocks, it certainly started smelling like a gas station.